Live humbly. love unconditionally. lead boldly. As I sit here and write, I contemplate actually putting this on my blog. I always have said I want this to be a vessel for God to use how He sees fit…but sometimes my fear gets the best of me. Sometimes I want to write about something a little less personal. A little less emotional. But for some reason, He says no and simply asks me to once again, trust Him and say yes. The one thing that He does though every single time through this process is pulls things out of me that I don’t see coming. Today, it was two things. The first was the image of a sailboat. Sailing gracefully out of a storm. A little beat up, but still afloat and more importantly, trusting its captain and their capabilities together. I think that was God’s way of telling me to hang on…..One. More. Time. The second thing He brought forth is one of my favorite songs. It’s called Oceans by Hillsong United. It gets me choked up every time I hear it and lately, it’s just dug a little deeper for some reason, and now I know why…………………. You call me out upon the waters, the great unknown where feet may fail. And there I find You in the mystery, in oceans deep … My faith will stand. And I will call upon Your name. And keep my eyes above the waves. When oceans rise, my soul will rest in Your embrace…for I am Yours and You are mine. Your grace abounds in deepest waters … Your sovereign hand will be my guide. Where feet may fail and fear surrounds me, you’ve never failed and You won’t start now. Spirit lead me where my trust is without borders … Let me walk upon the waters, wherever You would call me. Take me deeper than my feet could ever wander and my faith will be made stronger … In the presence of my Savior. All of us will face storms in life. Many have the power of taking us down, in many different ways. It’s just up to us what we do in that time…focus on the storm. Or focus on Him. If I choose to focus on the waves and raging sea right now, I will relapse. That’s how my storm will take me down. If I focus on Him…the storm is still there, but it’s quieter. It doesn’t hold the same power. Jesus has called me out upon the raging waters right now, amidst this storm in life, and all I need to do is trust Him. Fear surrounds me, but once again He has reminded me that He’s never failed and He will not start now. I call upon His name and can rest in His embrace and in doing that, everything about me becomes fixated on Him rather than the storm around me………and for a moment, my soul ……. is calm. Love you friend. Miss you. Hold on, girl! It won’t always be this way…As with anything, the more you turn to hold on to Jesus in the fearsome storm, the more automatic it will become. And the storm will become less fearsome. 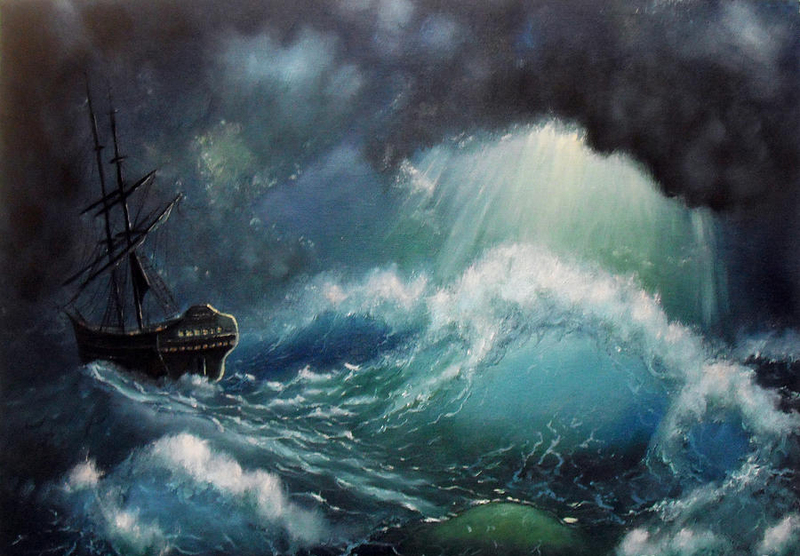 But it’s a rough ride on rough seas…So appreciate your transparency. Love you, and praying for you! The Danger in a Word.